The history of Aydin, situated in the South east of the Aegea region, dates back to 7000 BC The settlement has transformed from the village culture to the city culture over a period of thousands of years. The Aiols and the Ions, who arrived at the western Anatolia in 14th and 12th centuries BC, settled in the plains of Buyuk and Kucuk Menderes and founded the 12 Ion Cities Unity under the sovereignty of the Lidya Kingdom. The former name of Aydin, which was a famous centre of the art of sculpture during the antique era, was Trailles. Trailles was a centre, where commercial goods were gathered and distributed. These lands were occupied by the Frigs, Persians, Karyans, Helens, Romans, Byzantine and -in the 13th century- the Turk, after the Lidyan and the Ion civilizations. Works of art belonging to all the civilizations that ruled the region are exhibited in the local museum. Furthermore, the Paintings- Sculpture Museum housing examples of the Modern Turkish Paintings is located in the town center. The ruins that can still be seen in the city date back to the 2nd century. The mosques situated in the town centre were built during the Ottoman era. Among the most significant ones we can list the Uveys Pasha Mosque (1565), the Old New Mosque (1585), the Ramadan Pasha Mosque (1595), Suleyman Celebi Mosque (1683), Semsi Pasha Mosque (1659) and the Cihanoglu Mosque (1756). And again the most important public houses and madrasahs built again during the Ottoman Empire, are Zincirli Khan (1708), Cihanoglu Public House (1756), the Nasuh Pasha Madrasah (1708) and the Cihanoglu Kulliye (1756), these, again, are in the town center. Buildings belonging to the Helenistic, Roman and Byzantine periods can be seen in Trailles antique settlement area, which is only 1 km from the centre of Aydin . There are the famous Nyssa culture center remains of A.D. 2 among the olive gardens near Sultanhisar 45 km. to the North of Aydin. We have culture and arts activities in .Sultanhisar every year during the spring term. 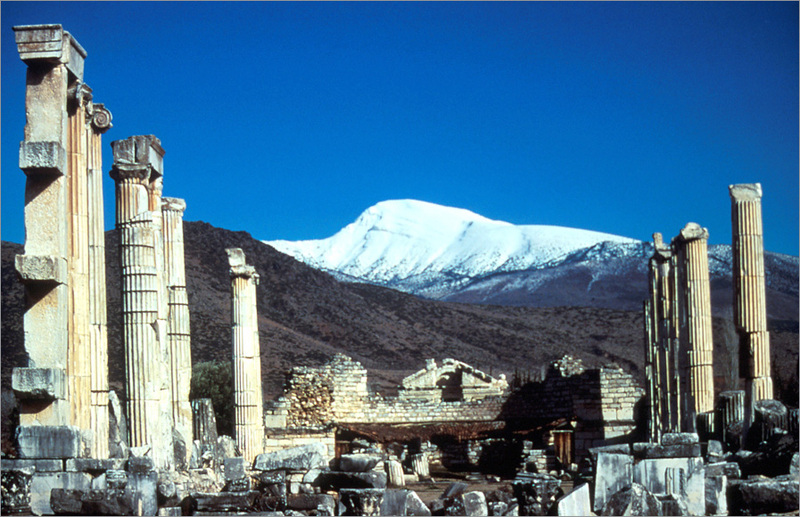 The ruins of the Alinda antique city, which was founded by Karyans, can be found to 2.5 km North of Nyssa, in the Karpuzlu County situated at the eastern skirts of the Besparmak Mountains. A theatre with a capacity to seat 5000 people, a duplex tower, an agora, the city walls and aqueducts are the attractions that may catch the attention of archeology lovers. Alabanda, on the other hand, is a Karyan city in the Doganyurt village of the Cine county. It has the ruins of structures belonging to the Hellenistic and Roman cultures. Magnesia in the Germencik county is significant because the Artemis and Zeus altars belonging to 3rd century B.C are situated there. Myus situated around the Avsar Fortess, near the Bafa Lake was one of the 12 cities linked to the Ion Unity. It was founded by Kydrelos who was the son of Kodros. the King of Athens, As a result of the alluvium brought in by the Büyük Menderes, the city has become an inland city and the surrounding have transformed into a swamp. 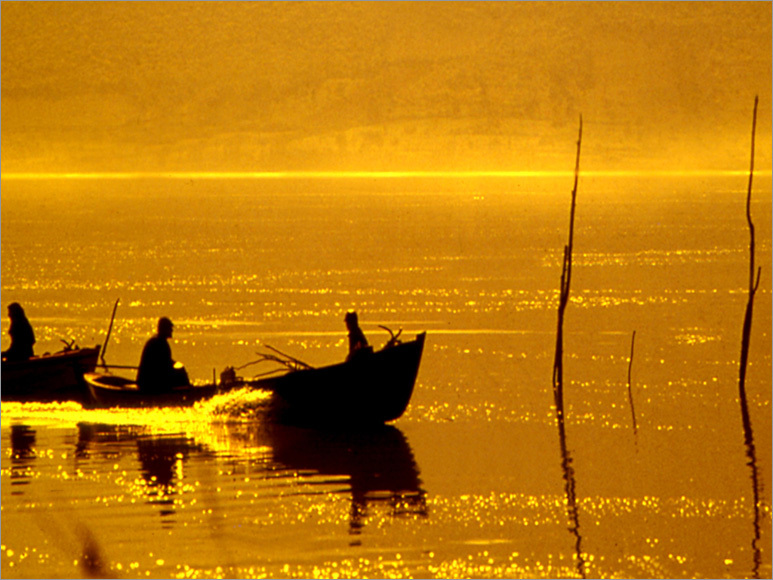 There are a lot of lakes in Aydin small and big. The Valley of the Menderes River have hosted many civilisations. The Camici (Bafa) Lake, called as the Latmos Bay in the 1st century, which is situated among dense pistachio nuts, olive and oleander trees, is a much liked tour area with its wonderful view. It poses a different view with its toothed coasted lake and many Byzantine monasteries and churches built on its small islands. The tourists have the chance to make a preference between the accommodation facilities on the coasts of the lake and the camping areas, as well. 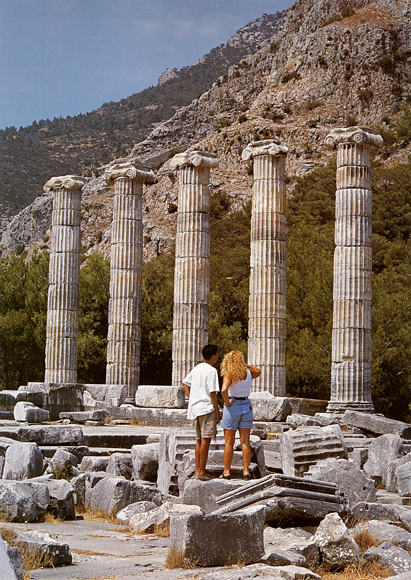 Priene is close to the Gullubahce county which is 12 km far from Soke. It is a natural platform overlooking the south at the skirts of the Mykale Mountain and an antique city founded around this platform. It was one of the busiest seaboard cities of the Ionian Cities Unity. The first city was founded by the Ionians on the coast in 1100 A.D. It shared the same fate with the cities of Heraklia, Ephesus, Milet and Myus. Whereas once on the coast and in possession of a seaport, Priene has receded 5.5 km from the sea,, as a result of the alluvium’s brought in by the Menderes River filling the Latmos Bay, thus becoming an inland city. It was founded for the second time in the area, where its remnants can be found now. Priene, which is seated onto the side of the mountain by the grill plan (a geometrical shape intercepting at right angles) of Hippodamos from Milet, is a good example of antique city planning. Hippodamos’ plan is still used in today’s city planning. Priene, which is surrounded by a solid and rustic city wall, is one of the most glamorous cities of Ionian Civilisation with its structures made of grey-blue marble unique to the region. It has been under the influence and dominance of Athens because it was founded with the help provided by Athens. Then, it has been reigned by the Bergama Kingdom and the Roman Empire. It became an important centre of episcopacy but it was deserted in the 13th century. To reach the antique city of Priene, you have to climb up a path. After walking past the Hellenistic city wall, you come across the other city remnants. The city, which is enclosed by city walls, has three main entrance gates. The Athena Temple, which is an important structure, was built at the peak for Athena. The architect of the temple is Pytheos, who is, at the same time, the architect of the Bodrum Mausoleum that is one of the Seven Wonders of the World. You can see the golden and ivory statues of the Goddess in the cella part of the structure bearing the characteristics of an Ionian temple. Examples of Hellenistic sculpture can be observed in the temple’s reliefs. Only five columns and the grounding of the temple have come down to today. Among the other structure of Priene, there are the Shopping structures, agora that is surrounded by showrooms, the holy stoa, the bouleterion that is in a fairly good condition behind the stoa with a capacity to house 640 people and a holy fire which is never blown up, and a prytanion next to it in which important quests were accommodated. And there are the stadium and the gymnasium in the lower terrace. There are the Zeus Atlar, the houses of the rich, the Egyptian Temple belonging to the Egyptian gods Anubis and Serapis, the Demeter Holy Space, the church and Alexander’s house to the North of Agora. 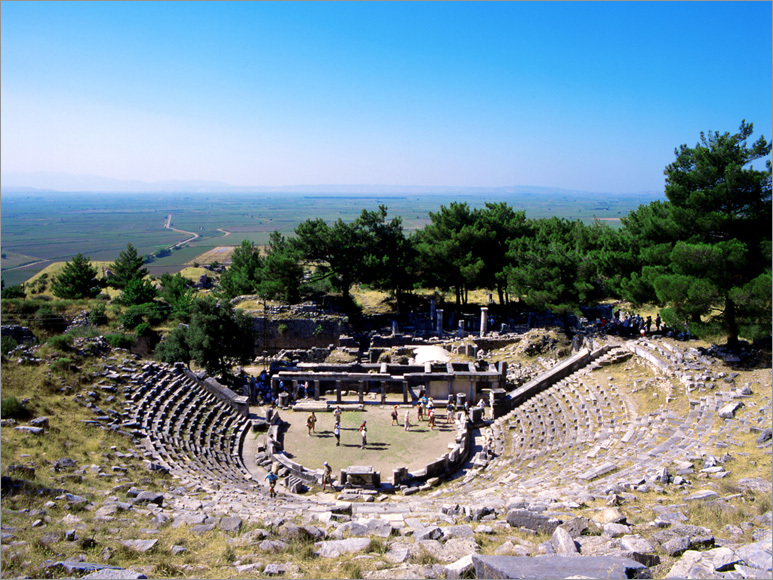 The theatre built in the 4th century BC, is among the most beautiful and most significant examples of its era. The 5000 seated theatre have arrived at today in a good condition. The bird’s eye view of the area is quite impressive. Aydin, which is fairly well developed in terms of tourism, is famous for its fig farming and its hectors. Apart from its sea tourism, museums and its ruins, it has a high potential for various tourism activities, as well. It attracts attention with the architectural works, hot springs, spas and traditional handicrafts of the Seljuq Sultanate, the Principalities and the Ottoman Empire; interesting festivals organised in the region such as camel fights and its culture tourism. Aydin offers unbelievably suitable options for sports activities such as nature tours on horse back, tracking, parachuting, playing golf, diving, marine and ground hunting, swimming, windsurfing, water sports. The east and South of Kusadasi, situated on the coast to the east and southeast of the Kusadasi Bay, 71 km away from the city centre of Aydin, is surrounded by mountains. 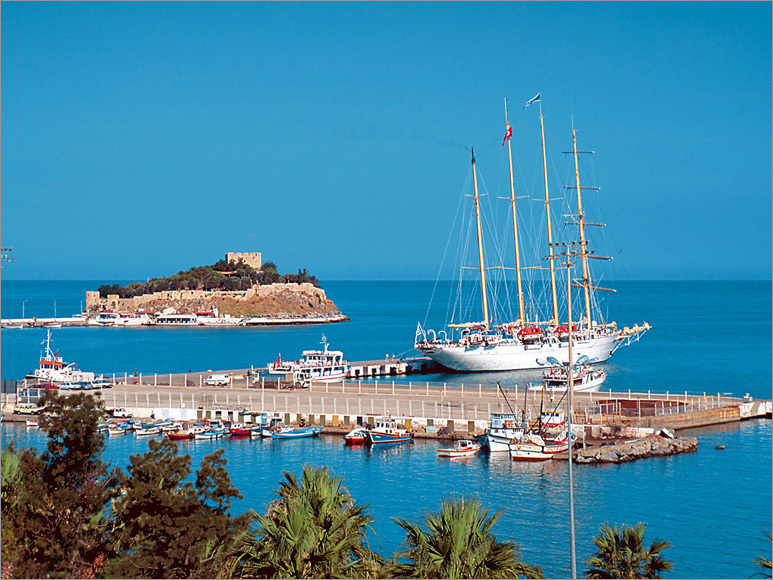 Kusadasi, which is named after the small bay in its vicinity, is a very attractive district with its large and modern marina. 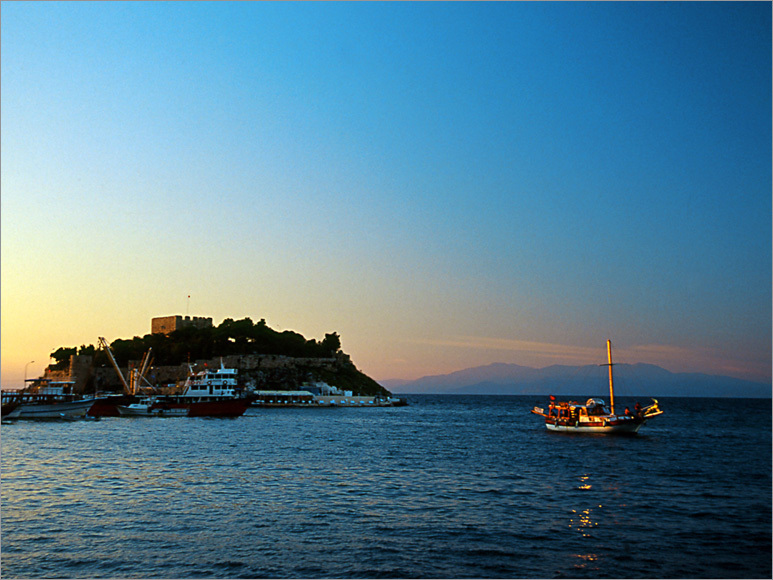 Neopolis, founded during the Ionian era, is the first settlement area in Kusadasi. It was founded in its current place before, in the Middle Age, under the name of Scala Nova. It was occupied by the Ottomans in the 15th century. City walls and aqueducts were built around the city during this period. At the heart of a lively Shopping center is the Okuz Mehmed Pasha Caravansaray, a luxurious hotel built in the oriental style. This Ottoman Structure dated 1618 is surrounded by high walls, has two floors and a garden. It also has a caravansaray, mosque and a bath. Apart from these, the Hanim Mosque, Ibrahim Aga Mosque, Turkmen Mosque and the Iki Oluklu Mosque in Kusadasi are some of the important mosques. 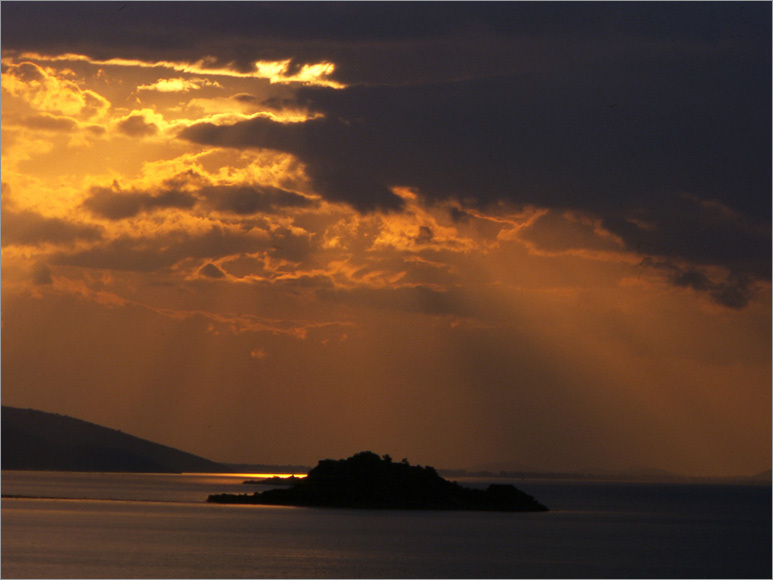 The Byzantine Fortress, built over the rocks, in the Guvercin Island, constituted a strong defense center during the Ottoman Empire, as well. The Ciban (Yavansu, Venus) Spa in Kusadasi, 31 Mineral Springs, and Guzel Camli Spa.are at the service of those willing to take advantage of health tourism. The Zeus Cave, Aslanli Cave and the Dilek Peninsula National Park, with its interesting trees, canyon, coves, beaches, picnic, touring, resting and water sports areas, are among the beauties that are worth seeing. The park, situated to 7 km west of the holiday resort 23 km North of Kusadasi, has a rich flora and wild life varieties. There lives the Anatolian Leopard (Panthera pardus tulliana) – one of the rare animal species- and wild horses, which are now facing extinction. 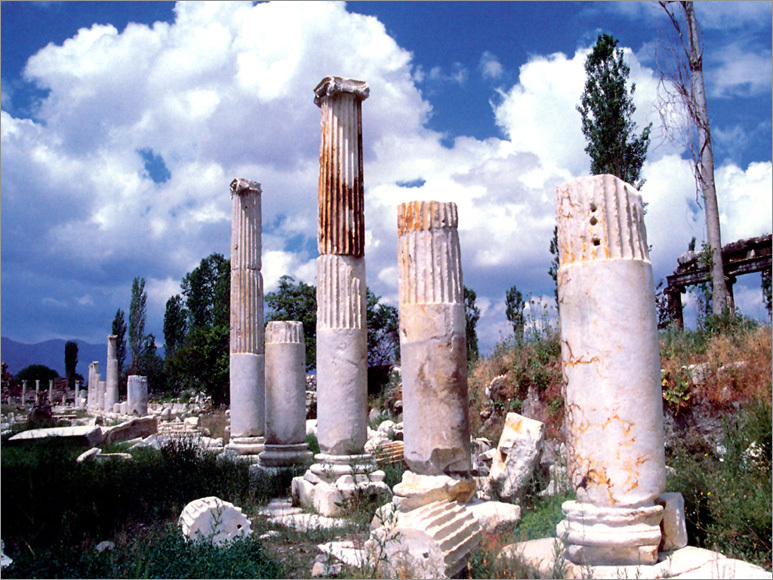 The remnants of the Paionion antique city in the Davutlar Subdistrict of Kusadasi are among the places that can be visited. Paionion is important for being the religious and political meeting point for the 12 Ionian cities, namely Milet, Priene, Myus, Efes, Kolophon, Eritrai, Klazomenai, Foça, Samos, Kios, Teos, and Lebedos. Kusadasi, which is one of the significant and developed centers of Turkey, feels as if it has been designed to respond to the pleasure of the holiday makers with a bay that does not have its match in the Aegea. The entertainment center near Kaleici provides entertainment opportunities for different tastes all throughout the season. 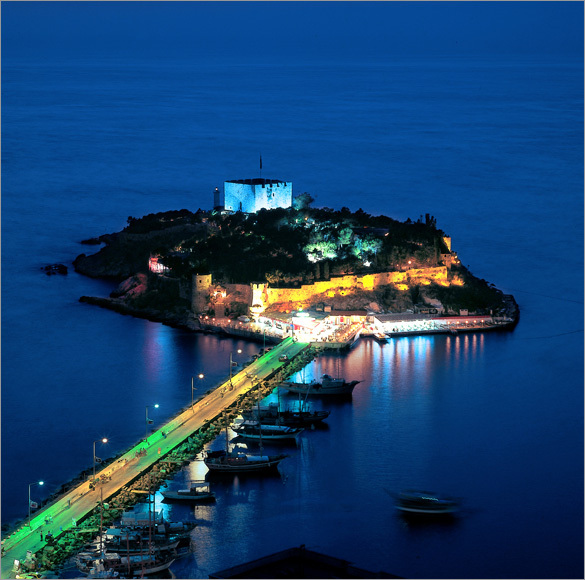 There are a lot of beaches, hotels, motels, camp areas, holiday resorts and entertainment centres around Kusadasi. The proximity of such antique cities as Ephesus, Priene, Milet, Didim, Heraklia, Hieropolis, Afrodisias increases the importance of Kusadasi. It is near the the village of Balat, between Priene and Didim, 20 away from Priene and 30 from Soke. Milet, founded on a peninsula where the Buyuk Menderes meets the sea, was an Ionian seaboard port city just like Priene. It is a city where some great philosophers and architects were born. The mathematician, astronomer and thinker Thales; the physicist and natural scientist Anaksimandros (610-574 BC ) and his disciple Anaximenos (550-480 BC); Architect Hippodamos and the architect of the Haghia Sophia Isidoros are all from Miletos. Mythology says that the daughter of the Cretan King Minos leaves one of her children Miletos on a mountain to protect him from Minos. Miletos, raised by the wolves and the shepherds on the mountain and comes to Anatolia and founds the city of Miletos. According to the findings, there was a period of Aka settlement in this city during the 1600s BC The Ionian city of Miletos started developing after the 7th century BC It has developed its trade through the colonies it founded in the Mediterranean, the Black Sea and Marmara regions, thus becoming richer. It became well-known as a center for trade, arts, culture and science. It was reigned by the Lidyan and Persian Civilisations in the middle of the 6th century BC The Persians destroyed the city in 5th century BC After being reigned by Hellenistic, Bergama Kingdoms, Roman and Byzantine Empires, it was taken over by the Turks. Turks were settled in the vicinity of the village of Balat. The settlement in the city is based on the grill plan. A plan consisting of rectangular or square divisions among streets that are parallel to or intersecting vertically with each other is used. The remains of Miletos, which had 4 seaports during the antique era, date back to the Hellenistic and Roman periods. As is he case with all the other cities, Miletos has a theatre, too. The height of the Hellenistic theater sitting on the side of a mountain is 30-40 meters. It was expanded during the Roman Empire to seat 19 thousand people. The structure rising above the theater is the remnants of the Byzantine Fortess. Behind the theater, the visitors come across the remnants among which they can see the Triton reliefs (half fish half man). This place shows the way to the port. The 15 thousands seated stoa between the port and the theater are rectangular shaped. The arch roofed Faustina Baths situated between the South agora and the theater date back to the 2nd century BC In this structure with maximum protection, there is a waiting room, cold and hot rooms, a frigidarium and lion relieved fountains, which are the symbol of Milet. 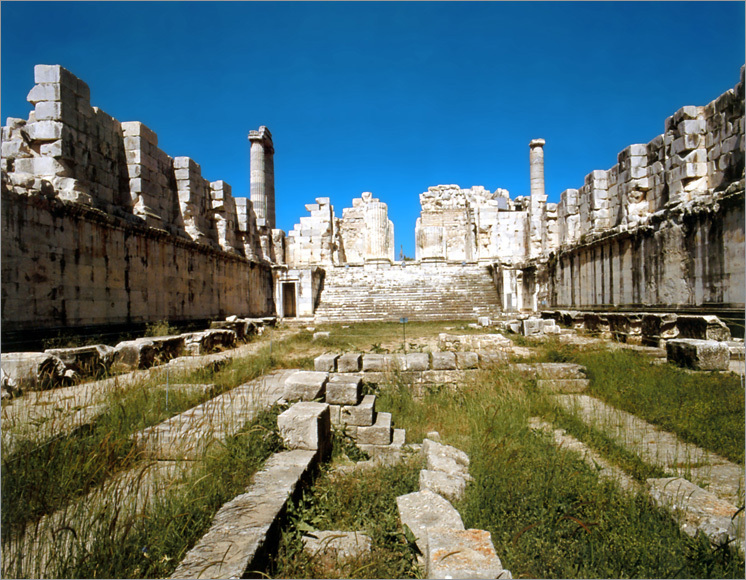 The other antique structures to be visited in Milet are the Serapis Temple, the Bouleuterion, the Toren Stree enabling the entrance to the city from the Aslanli port, Nymphanion, Delpinion (the place of worshipping to Apollo), the Gymnasium and the Grand Church. The Ilyas Bey Kulliyesi to the South of the theaterde is also one of the works of art worht seeing. The mosque attachment dated 1403-1404 showing the characteristics of Turkish style art of stone decoration is glamourus. Marble coatings, colorful mosaic stones and the portal reflect the characteristics of the era of the Principalities. The Milet carvansaray was built in the 15th century. 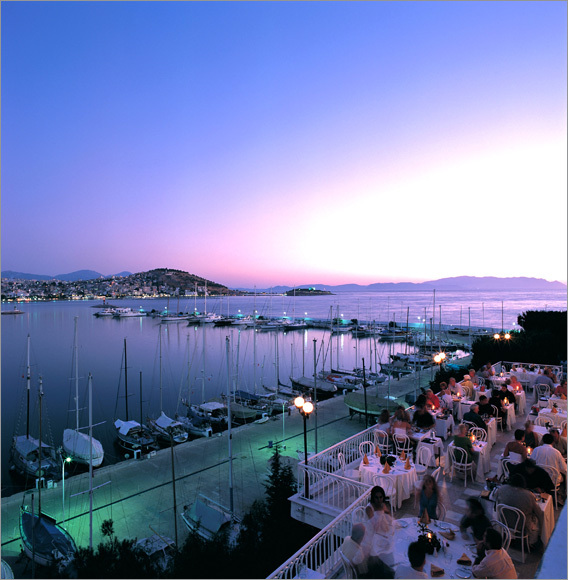 Didim is 73 km to Kusadasi and 110 km to Bodrum. It is a peninsula marked off by the Bafa Lake and the Menderes River at the North, the Aegean Sea at the west and the South and the Akbuk Bay at the east. 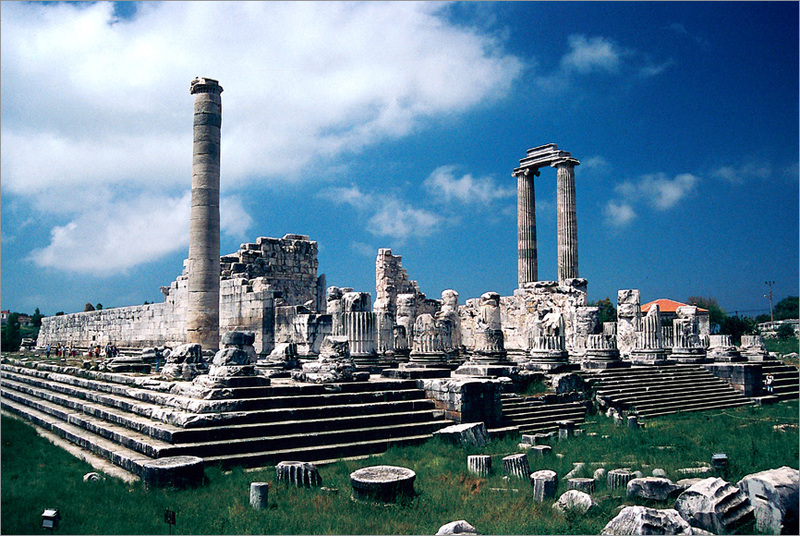 A temple was built for Apollo in Ddyma, which was a center of prophecy and which was a district of the city of Miletos. One day, Apollo, the god of light, sun, music and prophecy, comes across and very much likes Brankhos, who worked as a shepherd in the Dydma region. He teaches Brankhos the ropes of prophecy. Brankhos the shepherd builts the first temple for the Brankhid priests on behalf of Apollo in return. The structuring of the region, where the temple is situated, dates back to the Archaic era. The construction of the first temple in the holy region of Apollo started in 6th century BC and the construction lasted for two hundred years. This holy temple, which was taken over by Persians was detroyed, the treasures were plundered and the bronze statute that belonged to Apollo was stolen. This statute was returned to its original place 150 years later. Additions have been made by the Hellens, Seleukhos, Bergama and the Romans but it has never been able to be completed. It was greatly damaged in the earthquake that took place in the 15th century. It is reported that there used to be priest and manager statutes dedicated to Apollo on both sides of the holy road that went from Milet to Dydima, which was also called as Brankhidai (prophets). The prophet priests would say nothing certain about their prophecies; they would give open ended answers. Seleukos started the construction of today’s gigantic temple in the place, where the old temple stood; in 300 BC. 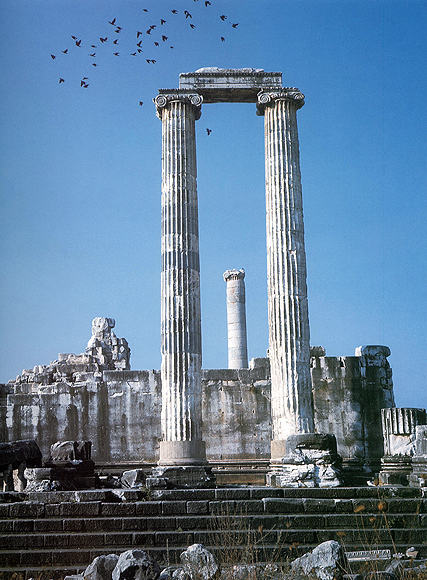 There are 10 double coiled columns on the narrow side and 21 columns on the wide side of the Apollo Temple, which was built in the Ionian style. Adding the Pronaos part, the total number of columns is 124. Two sloping labyrinths on the sides of Pronaos enable the connection to naos. The beds of the columns in the front part of the temple are decorated with akantuses, convoluted tree branches, flowers, geometrical shapes and mythological creatures that show Hellenistic characteristics. The freeze blocks of the temple are full of relieves featuring griffons standing opposite each other which are arranged symmetrically from mythological creatures. 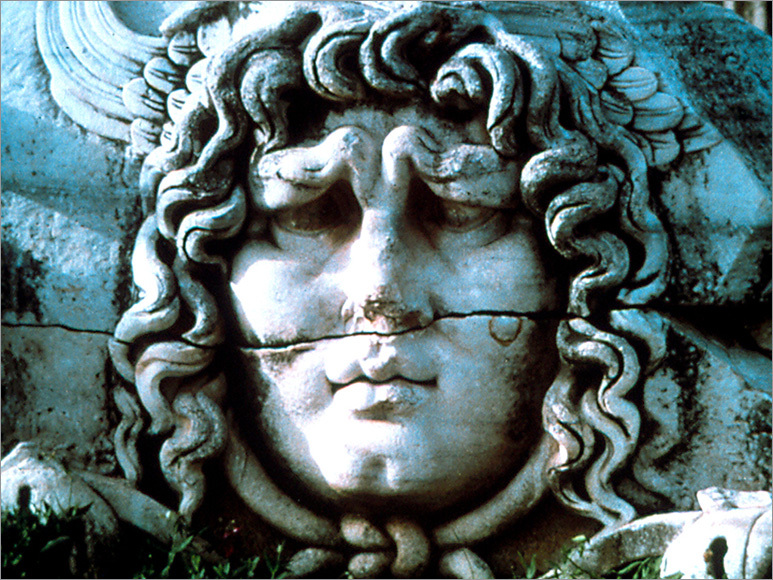 The Medusa head is the most important relief of the temple. Medusa is the mortal one and the snake-like haired one of the Gorgos (three sisters), who are the monsters of the underground world in mythology, that turns those whom he throws a look at to a stone. There are also other medusa relieves on the frizz blocks. These relieves were produced by sculptures from Aphrodisias. Sacrifices and offerings were made to God in the Poseidon Altar 7 km from the temple, in the region where the lighthouse is situated. The never-ending beaches, bays, the Blue flagged clean seaside resorts, warm and shallow sea, important ruins, entertainment facilities are at a level high enough to please the tourists. 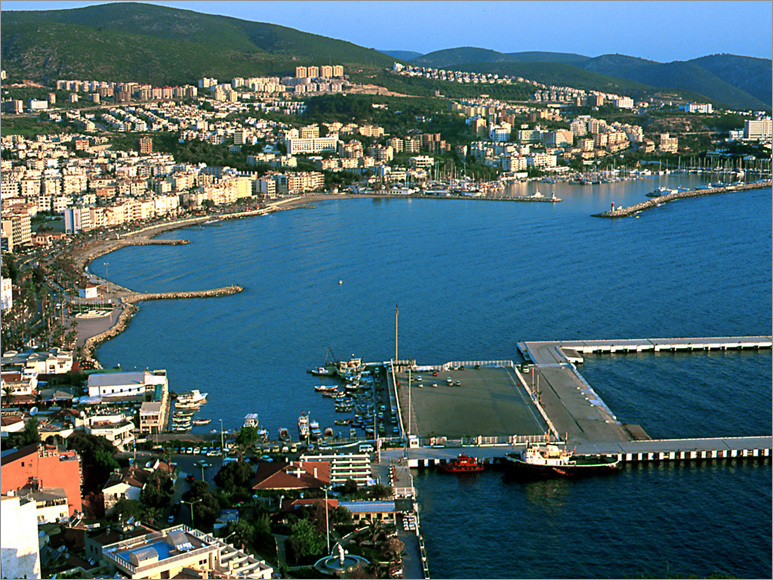 Altinkum, extending over 1 km in the south of Didim will be a wonderful choice for the tourists dreaming of the sea, sun, sand and entertainment. The Akbuk Bay 15 km far from Didim which offers many accommodation opportunities, is especially suitable for water sports. It is possible to shop in the carpet shops and Onyx (marble) and silver jewellery workshops around the Apollo Temple and to eat fish in the restaurants located on the Altinkum Beach. 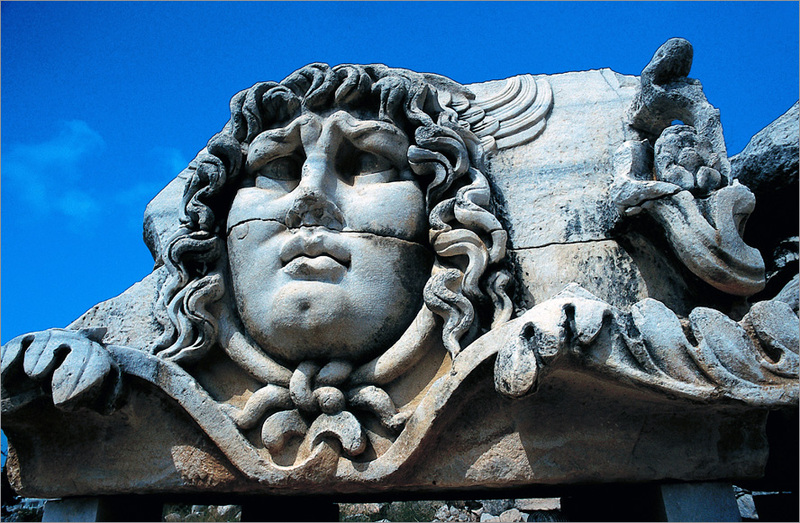 The city, anmed after Afrodite –the goddess of beauty- in 6th century BC, is located 12 km to the southeast of the Karacasu district of Aydin, between Nazilli and Denizli. 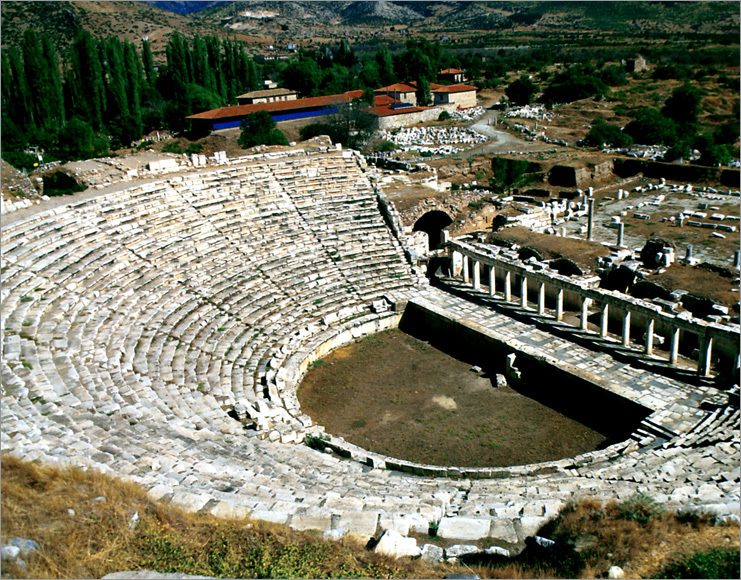 It is the second largest historical place in Turkey, first being the antique city in Ephesus. Geyre (Afrodisias), extending over a large area, has a long history. People first settled there in the Catholic Era during the 4000s BC The original name of Afrodisias was Lelegonpolice. Later, it became Megapolice. The city, which starte to be called as Ninos in 13th century BC, became of utmost importance during the 1st century BC the biggest gifts of the antique era would be cherished here on behalf of Afrodite, the goddess of love and fertility. It was an important center for architecture, science, philosophy, arts, sculpture and worship of the Roman era. The philosopher Alexander, writer Chartiton and the medcail researcher Xenocrates are all from Aphrodisias. The city, which, due to the Aphrodite Temple, was a place of hadj, had a lot of visitors. 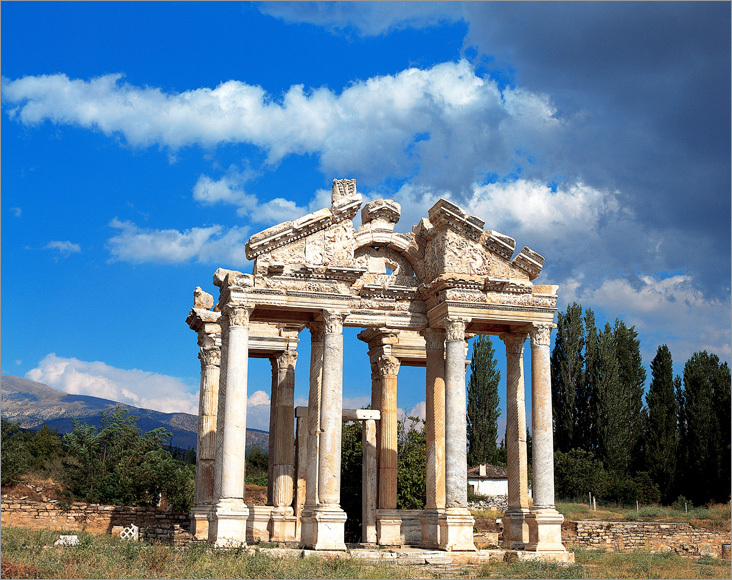 The first Roman Emperor Augustus that the single city in Asia that he chose for himself was Aphrodisias. The city was re-named as Stavropolice during the Byzantine era. The brilliant times of the city came to an end during the Byzantine era. The city was ruined by fires, earthquakes and attacks and then abandoned in the end. The art of sculpture was very widespread in the antique world and the Aphrodisias School of Sculpture was the biggest school of the time. The city was built with the big, blue-grey Kayran marble blocks. 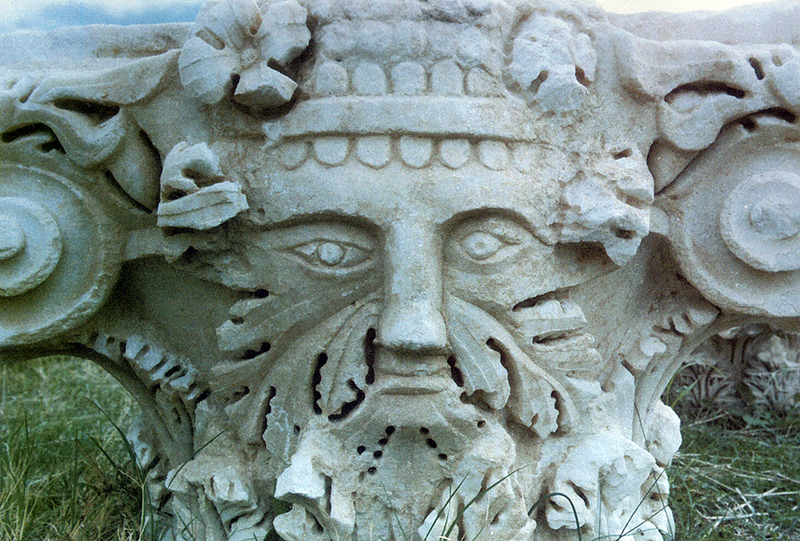 The sculptures carved in the marble extracted from Babadag near Aphrodisias were extraordinarily beautiful. 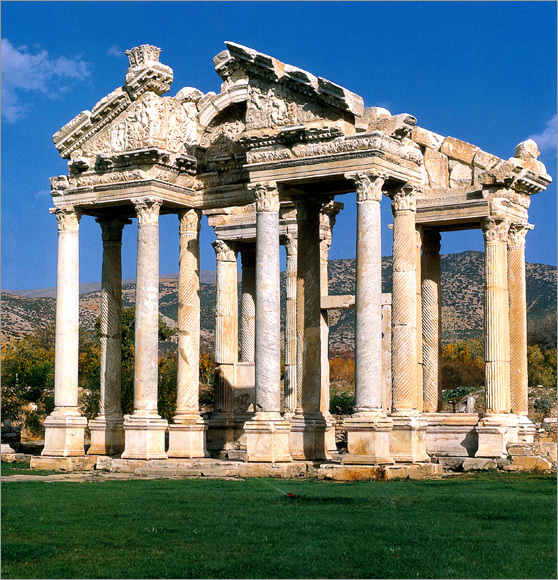 The masters coming from Bergama created the Aphrodisias style which was the continuation of the Bergama School of Sculpture in the Roman era and founded the Manierist School. 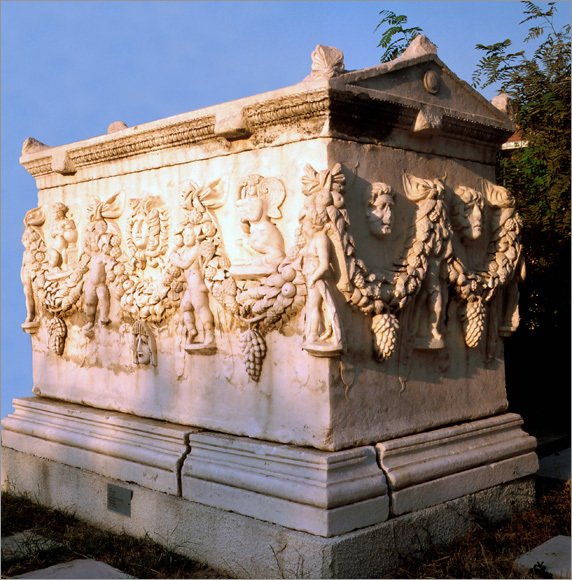 The Aphrodisias style marble construction elements, the sarcophagi, statute and portraits, relief and decorations were sent to different corners of the Roman Empire. The museum in the entrance to the Aphrodisias ruins is full of statutes. Some magical works dating back to the Calcholithic and Prehistoric Eras, the Lidyan ceramic works excavated near the Aphrodite Temple and the works of the Archaic, Classical, Roman, Byzantine and the Early Islamic periods are on exhibition in the museum. The hall housing teh statutes, reliefs and sarcophagi created by the Aphrodisias School of Sculpture, which displayed its activities from the 1st century BC to the 4th century A.D. is the section that attracts the most attention. The Roman city wall surrounding the city are 3.5 km. long. The Terapylon in the entrance to the Aphrodite holy area, a few miles from the museum consists of two doors with triangular facings supported by eight columns each. The Stadium with 30 thousand people capacity was a place where various sports events took place in the 1st century. However, later it was used as an arena. Only 14 columns are what remains today of Aphrodite Temple dating back to the 1st century, The temple was converted into a basilica during the Byzantine Empire. We can see the odeon, a concert hall and a meeting room that has come down to us in a splendid condition, is located a few miles ahead of the Episcopacy Palace belonging to the 5th century. The columned South Agora was used till teh 7th century. The state buildings were coated with marble tables through a master workmanship. The Hadrian Bath, the theatre with a capacity of 10.000 people which is in a good condition, the odeon decorated with statutes and mosaics are real works of art. The Agora with a pool, the theater bath, sebasteion, the school of philosophy whose floors are decorated with mosaics, the gymnasium, the Byzantine House with two gardens and the Roman tombs to the east of the stadium are the others what remains of the city. The Archeologist Proffesor Kenan Erim Kaya, who spent 29 years carrying out excavations in the region, was buried there. 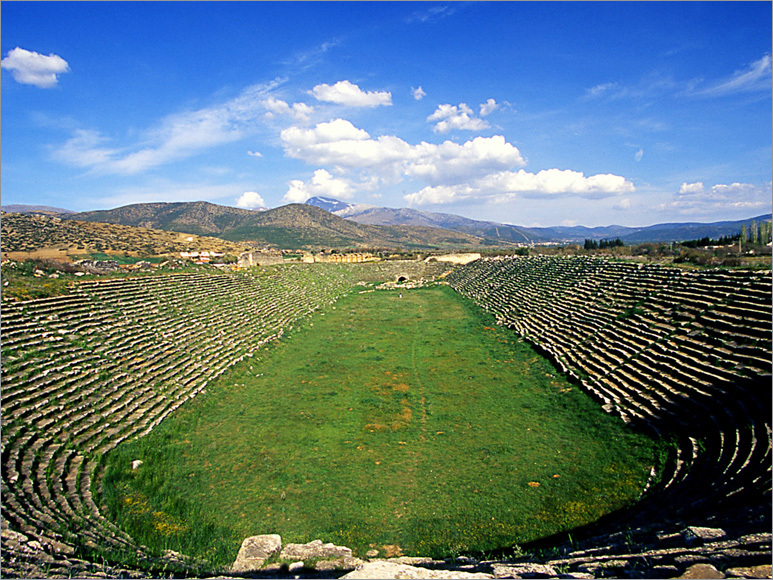 About 300 thousand visitors flow into Aphrodisias extending over a very wide area. 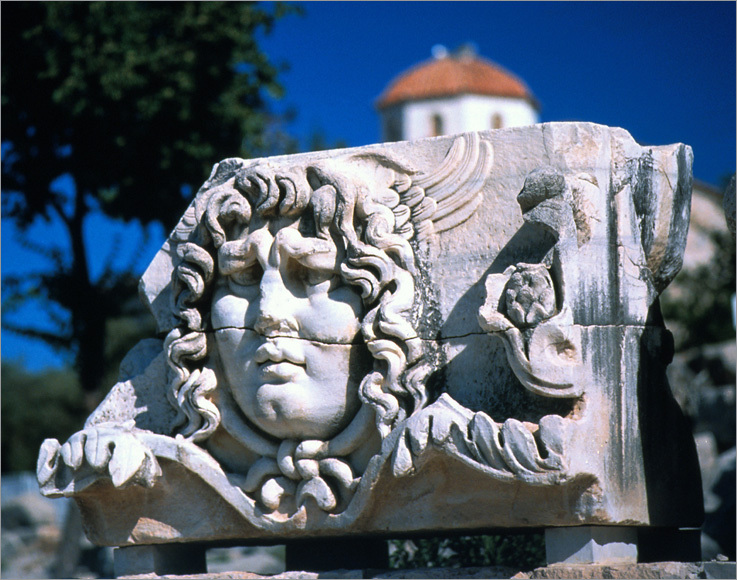 Aphrodisias is a glamorous and impressive place that can over-satifsy archeology, arts and history lovers.